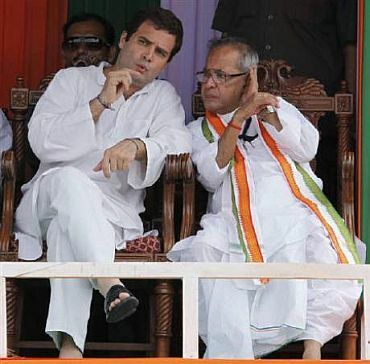 Rediff.com » News » Bihar: Last stop for the Rahul juggernaut? Bihar: Last stop for the Rahul juggernaut? The Congress took the gamble of going it alone but Rahul Gandhi's magic, like it did in Uttar Pradesh, failed this time in Bihar with the party recording its worst-ever performance in assembly elections in the state in last 10 years. 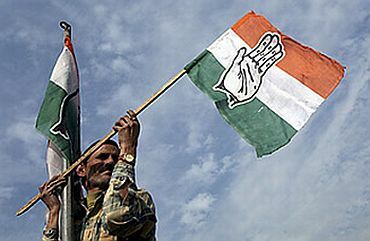 The party's tally was reduced from 9 in the last elections to four this time and to add to its humiliation, both Pradesh Congress Committee chief Mehboob Ali Qaiser and the Congress Legislature Party leader Prakash Ram lost. Rahul Gandhi had undertaken a whirlwind tour of the state in this election and visited the state seven times addressing as many as 19 election meetings and rallies. The places he went included Samastipur, Saharsa, Katihar, Supaul, Araria, Sitamarhi, Mujfaffarpur, Begusarai, Bhagalpur, Bachcharwa, Munger, Kahalgaon, Barbigha, Hisua, Shekhpura, Buxar, Bhabua, Sasaram and Obra. 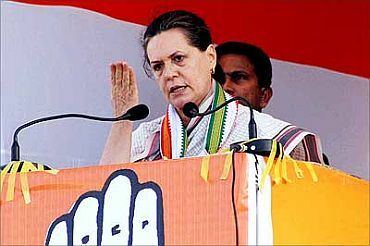 Similarly Congress President Sonia Gandhi addressed rallies in Kishanganj, Motihari, Begusarai, Bhagalpur, Buxar and Bhabua during her three visits to the state. 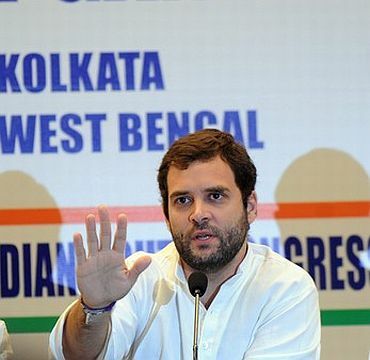 With Rahul evincing keen interest in Bihar poll, the hopes among the Congressmen were high. Except former PCC chief Sadanand Singh, the others who won this time are not well-known faces. Former PCC chiefs Ramjatan Sinha and Avdhesh Singh have also lost. Qaiser was appointed just before the elections replacing the incumbent Anil Sharma apparently with an eye on Muslims, which constitute around 16 per cent of the state's voting population. The party was hoping for a return of Muslims to its fold like in Uttar Pradesh where it made a turnaround getting 22 seats in the last Lok Sabha election after remaining out of power for last 20 years. However, the strategy to woo the minorities did not seem to have cut ice with the voters in Bihar. Even with BJP as its ally, the JD-U seemed to have pulled Muslims for the ruling alliance. 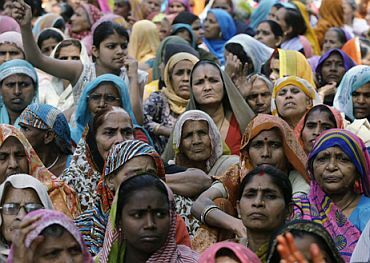 In the run-up to the polls, Minority Affairs Minister Salman Khurshid had said: "We were ill there (Bihar). We got a good doctor, who gave us the right medicine". He added that the party would be able to revive in Bihar. The results have, however, poured cold waters on Congress' hopes and gave the BJP an opportunity to take a dig at Congress. "Congressmen were blowing their trumpet and chanting Rahul's name. Where is that Rahul factor," wondered senior BJP leader Ananth Kumar. He said in Bihar Congress needs to be "searched out" party spokesperson Prakash Javdekar said the poll in Bihar has exposed that the "biggest myth is a Congress resurgence. Congress is no longer relevant in any part of the country". Senior BJP leader Arun Jaitley said the election results have showed that politics of Bihar has changed and that 'charisma or family' does not win elections, in an obvious attack on RJD chief Lalu Prasad and Rahul Gandhi who campaigned for Congress. However, Wasnik refused to accept that the charisma of Rahul Gandhi and Sonia Gandhi failed to work in Bihar. 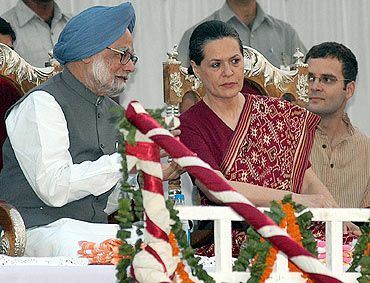 Wasnik said: "The time which Congress President Sonia Gandhi and Rahul Gandhi gave for Bihar had benefited us greatly. It enthused our party workers. None of their rallies had less crowds." In the 2000 assembly elections, Congress had contested alone and won 23 seats in the undivided Bihar of which 11 seats were from areas that later became part of Jharkhand. In February 2005 elections, the party contested the elections in alliance Ram Vilas Paswan's LJP and won 10 seats. Congress then had an undeclared agreement with Lalu Prasad's RJD under which neither of them fielded any candidate in each other's sitting seats. In October 2005 elections, Congress contested in alliance with RJD and could get 10 seats, while Paswan's party waged a lonely furrow. Results so far show a gradual decrease in the number of Congress seats in the Assembly elections in the state, a trend that continued even in this election. While Congress insiders feel the failure in this election was due to Nitish Kumar's development agenda as well party's wrong selection of candidates, party President Sonia Gandhi said the party has to start from a scratch to rebuild itself in the state. "As far as our party is concerned, we did not have much hope. We took a deliberate decision not to work in alliance with other parties. Results obviously indicate that our party has to start from the scratch to rebuild itself and that is what we plan to do," Gandhi said reacting to results. 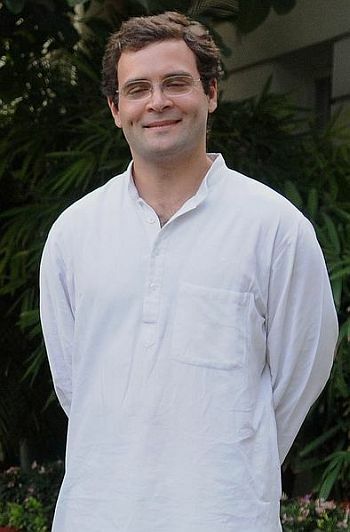 Party insiders, however, said that the message of Rahul Gandhi could not be carried forward in the election as the same elements, which had brought disrepute to Lalu Prasad's RJD government in past were given prominence in Congress "that too when we wanted to send a message that we have nothing to do with Lalu". "Lalu's brother in law Sadhu Yadav not only got party ticket but played a role in ticket distribution in many constituencies. Strongman Pappu Yadav's wife Ranjeet Ranjan also joined Congress and so did Anand Mohan Singh's wife Lovely Anand. How could be send a message that we would do something different from what Lalu did," a party leader said. All of them stand defeated. Asked who is to be blamed for such debacle of the party, party spokesperson Shakeel Ahmed said," all of us Congressmen in Bihar are responsible for it". 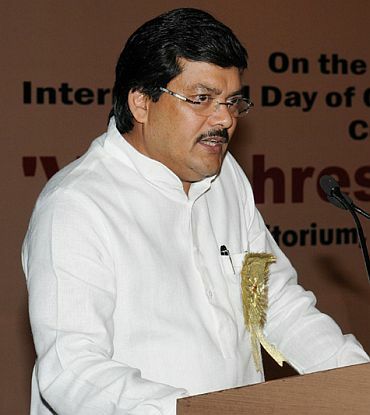 Owning "full responsibility" for the results, AICC general secretary in-charge for the state Mukul Wasnik said that all these issues on why such a result has come will be looked into. "We will have to find out the reason as why we could not translate the huge crowds that came in rallies addressed by our party leaders into votes," Wasnik said, adding Congress politics in Bihar was passing through "tough times". The Congress is the only party, which had fielded candidates in all 243 constituencies followed by the BSP which contested 239 seats. The JD(U) contested 141 seats and its ally BJP 102. 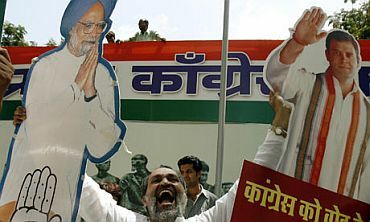 Congress spokesperson Manish Tewari said: "We had decided to go alone to rebuild our party in the state. It was a difficult decision when we decided to go alone. By going alone the base which we had lost we would try to regain that." Recalling the outcome of the UP Assembly polls, he said, "I would like to take you back to the UP elections in 2007 when the Congress went alone and did not fare well. But again like Bihar It was a beginning (to go alone)." "In 2009 general elections in UP, there was an exceptional recovery and Congress did reasonably well in the state," he reminded. Putting up a brave face, Tewari said, "Results are not surprising... We are trying to rebuild the party after being in one alliance or another for 20 long years. So it is a difficult process we took a conscious decision to go it alone and there is no looking back. Hoping that Congress will stage a comeback in the state he said, "Ultimately the position we have taken will stand vindicated (one day)." Acknowledging that there is difference between UP and Bihar, another party spokesperson Jayanthi Natarajan expressed confidence that "next time, we will improve our tally". However, an old guard of the party Bihar said, "it was an opportunity that was squandered. The way we carried out the election exercise convinced voters that we are not serious players. We have now been pushed back to where we were standing and chances any revival of the party in coming many years now appear a bleak possibility."